A small portable shrine sits in a glass case in the Metropolitan Museum of Art, not far from where crowds gather to admire the museum’s famous Christmas tree. 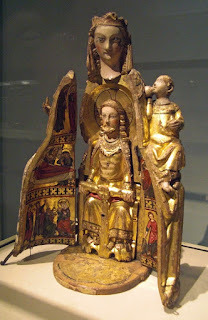 Carved from wood in about 1300, it was probably a commission for a wealthy German noble. Meant to represent the miracle of the Incarnation, the Virgin Mary and baby Jesus open up to reveal what had originally been all parts of the Trinity. Only God the Father remains, but the painted "wings" still tell the story of the Nativity in colors as bright as when the shrine was made. As we get ready to celebrate Christmas, I am thankful that small miracles of craftsmanship like this have survived to remind us of why we celebrate that day.